Did I just make a sports reference? I think I did. But it's true - this weekend marked the opening of Yard Sale / Rummage Sale season in Maine, my favorite sport. The warming up happened at a highly-attended annual church rummage sale in town. Highly attended by many people - I think you could have done a who's who of Portland bloggers in there - quite fun, and completely overstimulating at the same time (the sale, not the bloggers). Anyway, it was nice to get back into the swing of things - you know, the crowds, the searching, the craziness of it all. Good stuff. And a happy little showing for the day too, with many of the usual suspects. 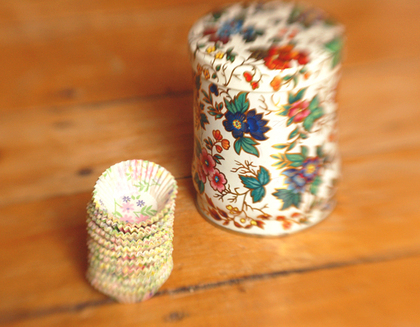 Some tins, that pile of muffin cups that I'm ridiculously happy about (should have photographed the box, too - so cute), and of course, some fabric. I think you'll see that wool on the left turned into something else very very soon - I keep giving it the eye in my studio. Ooh, actually looking at it in the photo right, I think I just decided what to do with it. Fun. 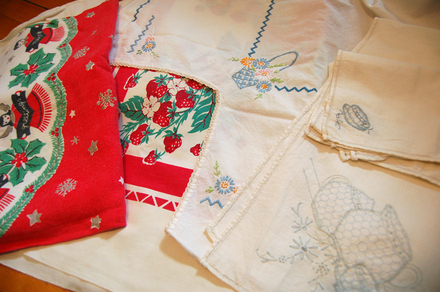 And always, a few linens. 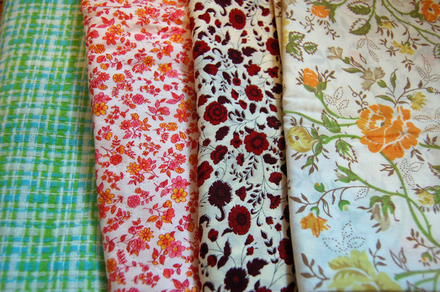 Some will be used as is, and some will be used in sewing projects. 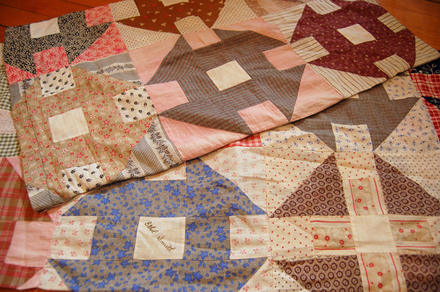 My favorite find of the day - these patchwork quilt pieces. I can't for the life of me figure out what it was on it's way to becoming, because both of these sides are covered in the squares, and sewn on three sides - large pillowcases perhaps? 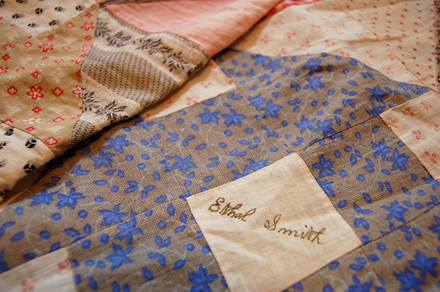 In the center of many of the squares are the handwritten names of the quilters, I presume. Yeah, I'm pretty excited about this one. Thank you Ethal. And Francine, Almina, Etta, Charlotte, Laura, Anna, Florence, and Agnes. Thank you very, very much.